Mobile diabetes-management company Glooko has raised $3.5 million more in a Series A round from its impressive list of investors, which include Chamath Palihapitiya’s Social+Capital Partnership, Bill Campbell, Vint Cerf, Judy Estrin and Andy Hertzfeld. 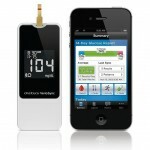 The Palo Alto, Calif., company sells a $39.95 cord that connects to blood glucose meters and feeds data to a free iPhone app. The promise of the company is to elevate the geek hobby of quantifying oneself to the next level — health care.